We have a new Associate Justice, Sam Alito. This means we still don't have a Justice from Florida -- EVER. I still think it's time we get one. My favorite picture from all the coverage is the one at the upper left, with his family in front of the Clinton potrait. BTW, lots of comments lately. Although we're not debating who the better PD is or whether a lawyer has ever slept with a juror, the debate is interesting. Check it out. UPDATE -- someone doctored the Clinton picture. See here. ... is Andrew Lourie, a career AUSA here in Miami. Lourie will take over the public integrity section of the Department of Justice for Noel L. Hillman who has been nominated for a federal judgeship. 1. What's the story on Lourie? Representatives of a Chicago law firm posed as American Red Cross grief counselors to gain access to relatives of the victims of a Chalk’s Ocean Airways crash in Miami, according to complaints filed with the Florida and Illinois bars.As a result of the complaints, The Florida Bar is also investigating a West Palm Beach-based law firm for possible violations of Bar rules in its solicitation of the Bahamian relatives of passengers who were killed in the Chalk’s seaplane crash.The alleged misconduct also could violate a federal law intended to protect the families of plane crash victims from being approached by lawyers immediately after the death of their relatives.The Bar complaints were filed on Jan. 3 by Miami lawyer John Ruiz, who represents relatives of one of the crash victims. He contends that lawyers for the Rose Law Firm of West Palm Beach and the Chicago-based Nolan Law Group used improper client solicitation tactics. According to the complaint, lawyers from the firms posed as psychiatrists and Red Cross volunteers, and knocked on the doors of the grieving families in Bimini as early as the day of the crash. ... have resulted in some extremely tough sentences. So if a prosecutor and a defense attorney agree that a particular case merits a particular sentence, should a judge be permitted to impose a harsher sentence. That's the question being argued in a case in which the government and defense agreed to a sentencing range of 57-71 months for a defendant who pleaded guilty to alien smuggling (which resulted in the tragic death of a 7 year old boy during the chase on the high seas). Judge Moore has indicated that the agreed upon sentencing range (which is based on an enhancement for death) is not sufficient and has asked for briefs from the parties as to why he should not go higher. The question is an interesting one. If, as Chief Justice Roberts has suggested, judges are merely umpires who are supposed to call balls and strikes, then why should the umpire call what the parties have deemed a strike as a ball. In other words, it is the government (who represents the people) and defense (who represents the defendant) who know the case the best and who have fought -- under our adversary system -- to reach a result that both sides could live with. Why shouldn't the judge enforce that agreement? Thoughts? Here's the AP story on it. UPDATE -- The first comment lays out the case for the judge taking such action. Interestingly, according to Jay Weaver, AUSA Dana Washington explained to the judge that the sentence was reasonable and that the sentencing guidelines took into account the death. He cited to a previous case in which Judge King was reversed for departing upward to life. If the prosecutor, who represents the people, believes the sentence is enough, should the judge (umpire) take a different position? Julie Kay details in today's DBR -- U.S. Attorney has sign out: Help Wanted -- that the U.S. Attorney's office is hiring due to the large number of vacanies. Those mentioned in the article as recently leaving: Marvelle McIntyre-Hall (retiring) , Gerald Greenberg (Stearns Weaver) , Aimee Jimenez (USAO in Washington), Lilly Ann Sanchez (Fowler White), Carlos Castillo (Seidman Prewitt), Jonathan Lopez (Justice Dept DC), and Dan Fridman (Justice Dept DC). The article also says that "The Justice Department has always used the Miami office of the U.S. Attorney's office as something of a farm team." Those working in DC with ties to Miami: Barry Sabin, Michael Mulaney, Paul Pelletier, Drew Osterbaan, Mary Butler, Ed Nucci, and now Fridman and Lopez. 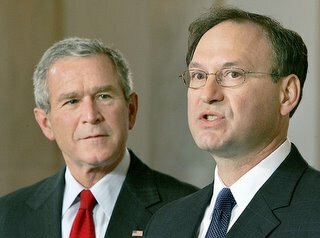 If you haven't had enought Jack Abramoff news, here's a Miami Herald article by Jay Weaver summarizing what has occurred in the case. Weaver explains: "prosecutors Lawrence LaVecchio and Paul Schwartz and Jeff Sloman, chief of the U.S. attorney's criminal division in Miami, flew to Washington to meet with senior Justice Department lawyers. With them was veteran FBI agent Susan Sprengel" to explain how deep the case ran. Everyone is still waiting for all the indictments. Another Miami blogger says don't hold your breath. Could the FIU prof and his wife accused of being Cuban spies be headed to trial? Sounds like it might be heading that way. Not because of the not guilty pleas -- that happens in every case -- but because the lawyers' comments seem to suggest a fight is ahead. Read here and here. In other news, Herald writer Ana Veciana-Suarez pleaded guilty to a contempt of court charge for not disclosing her father's criminal history during jury selection in a 2003 civil trial . Yesterday the Supreme Court decided unanimously a habeas case, Rice v. Collins, which in the scheme of High Court rulings didn't shake the legal establishment. What's extremely interesting about this case is the concurrence by Justice Breyer re-affirming his position that we should do away with peremptory challenges altogether. I wrote an op-ed for the Miami Herald over the summer supporting this position. At the time, Breyer was alone on the Court in his belief that the only way to do away with discrimination in jury selection was to eliminate the peremptory challenge. He picked up a vote yesterday with Justice Souter who joined in the opinion. It looks like this idea is starting to pick up some momentum. The last time this topic was brought up on the blog, it brought about a lot of discussion. Any new thoughts? Blawg Review #40 picks up our Padilla coverage here. What is the future of federal sentencing? That is the debate topic at Legal Affairs. The debate is between Doug Berman and Frank Bowman. I wanted to thank all of you for reading and for the nice comments and emails you have sent to me about the blog. 2006 has started off well for SDFLA. We have topped 10,000 total hits and are now averaging more than 175 hits a day. The blog has been cited to by some of the bigger sites around -- TalkLeft, SCOTUSBlog, and HowAppealing. And we have added a blogger, Marc David Seitles, bringing our total to 3 (anon has been awfully quiet lately). An update on the funniest Southern District of Florida judge -- Judge Moreno is leading in the polls by a lot. He currently has better than a 2-1 advantage over Judge Ungaro. A close third is Judge Palermo. Blogging from me will be slow this weekend as I'm on vacation (the last time I'll be able to get away before baby #2 is born and before I start a six week trial in Savannah Georgia). Thanks again. Padilla's Application to Join al Qaeda? Did he apply or not apply - that is the question. So says Judge Moreno about the old Flagler Bridge, adding that the U.S. policy differentiating the abandoned bridge (wet foot) and the usable bridge (dry foot) is a "ridiculous distinction." The Herald explains: "Under the government's long-standing ''wet-foot, dry-foot'' policy, Cubans who reach U.S. soil are generally allowed to stay, while those stopped at sea are returned to the communist-ruled island unless they can demonstrate a fear of persecution." I attended most of the bail hearing for Jose Padilla this morning in front of Magistrate Barry Garber. Although I didn't stay for the stunning conclusion, after you read my summary, I'm sure you'll be able to surmise whether Mr. Padilla will be serving the next nine months at liberty or in the special housing unit of the Detention Center. The hearing started out with the arraignment of Padilla. Chief Assistant Federal Defender Michael Caruso said Padilla is "absolutely not guilty." Caruso was flanked by Tony Natale, Orlando do Campo, and Andy Patel. Although the courtroom was packed, it seemed that less press attended the hearing and the security (although more than for any other defendant) was not as thick as it was for the previous two hearings. I counted around 10 marshals and court security officers. Padilla's mom and other family members were also in attendance. Garber asked Padilla whether he pronounced his name padiYa or padiLLa and Padilla responded with the hard L -- Padilla. AUSA Stephanie Pell was the government lawyer who handled the proffer to the Court. She went through the indictment, explaining that Padilla was recruited to travel overseas to participate in a violent Jihad. They even have what they believe to be his application to be a member of Al Queda and numerous intercepts from FISA. She also explained that they had cooperating witnesses. Her proffer lasted about an hour and is too long to reproduce here. Pell was joined by AUSA Russ Killinger and an agent. Michael Caruso, who referred to his client as Jose, then asked the Court if he could question the agent on the case. He specifically wanted to ask about translations and the application. He also wanted to ask the agents about the "methods of interrogation" of the cooperating witnesses. He said that he needed to question the agent because "weak is not even the right word to describe the evidence against Jose." Garber denied the request to question an agent saying that Caruso wanted to conduct a minitrial. Caruso tried again, and a funny exchange ensued with Caruso saying that they had plenty of time because Garber kept the case instead of putting it on the regular calendar and Caruso was thankful that Garber did so. Garber responded: "You're thankful even after I ruled against you?" Caruso: "I'm trying to butter you up." Garber: "Nice try. But denied." Caruso then went into the history of confinement with Padilla -- how he was in total isolation without a lawyer, family or anything for 2 years. Then he got a lawyer, but he still was in a military prison with 10 cells and he was the only prisoner. "It is far beyond what any other American citizen has had to endure," said Caruso. Both sides then went back and forth over the risk of flight and danger to the community and I had to leave. But based on Garber's refusal to allow the agent to be questioned, I have to assume that he will grant the government's request for pre-trial detention. More when I can confirm it. UPDATE -- confirmed. Here's the AP article. And here's the drawing of Padilla and AUSA Pell. I'm usually a fan of Shirley Henderson's work, but I don't think this picture does Pell justice and I think it makes Padilla look older and thicker than he looked in court. Although some of you have asked me about my represenation of Gilberto Rodriguez-Orejuela and about today's DBR article, because the litigation is ongoing and because I am involved in one of the issues, I will not comment at this time. 1. Padilla's bond hearing is tomorrow at 10AM in front of J. Garber. I am going to try and attend if work permits. 2. Congrats to AUSA Daniel Fridman (from this District). He has accepted a special assignment to work with the Acting Deputy U.S. Attorney General Paul McNulty (the #2 guy at DOJ in DC) on shaping the administration's criminal and civil rights policy. Those that know Dan, know that he is a good and fair prosecutor and I hope he uses the time in DC to promote his even-tempered philosophy. 3. Way off topic -- for those interested in a high profile exciting murder case involving allegations that you wouldn't believe if you read about them in a book, check out http://www.probodybuildingweekly.com/ and click on the replay of the telecast in which I serve as a legal analyst (I come on at around the 12 minute mark, after the break). For all the information on the case, you can check out www.titusandryan.com or www.getbig.com. It is with pleasure that I welcome Marc Seitles as a co-blogger to the Southern District of Florida blog. Marc is a former Federal Defender in Miami and just started his own practice here in Miami. Padilla, Abramoff, and now FIU professors accused of spying for Cuba... Only in the Southern District of Florida. Here's Jay Weaver's and Noah Bierman's article about the spy proceedings yesterday. Please be advised that two defendants involved in a national security matter are scheduled to make their Initial Appearances in federal court today, January 9, 2006, at 1:30 p.m., before Magistrate Judge Andrea Simonton, at 300 N.E. First Avenue, Miami, Florida. A press conference will follow at the U.S. Attorney's Office, 99 N.E. 4th Street, Miami, at 2:30 p.m. The United States Attorney and representatives from the Federal Bureau of Investigation and the Naval Criminal Investigative Service will be available to the media. UPDATE -- Nope, not terror. More spies -- according to the Associated Press. Here's the intro to the article: "A college professor and his wife have been charged with being longtime illegal agents of Cuban President Fidel Castro, The Associated Press has learned.Documents filed Monday in U.S. District Court show that Carlos Alvarez, a psychology professor at Florida International University, and his wife, Elsa Alvarez, have been charged with acting as agents of Cuba without registering with the U.S. government as required." SECOND UPDATE -- They were denied bond. Magistrate Judge Barry Garber presided over the proceedings and asked Jose Padilla if he had an attorney. Mr. Padilla responded that "Andy Patel" was his lawyer. Judge Garber then proceeded to ask Patel about whether he was going to represent Padilla in this case. Patel said that he wasn't a member of the Florida Bar and thought it would be best if the Federal Defender's Office in Miami was lead counsel. Judge Garber thought that was a great idea and asked Chief Assistant Federal Defender Michael Caruso if his office would accept appointment, to which Caruso responded that he would "gladly accept" the appointment. Judge Garber said he was going to appoint dual counsel, with the Miami Defender's office taking the lead and Patel to serve as co-counsel because he has been in the case since June 2002. AUSA Stephanie Pell then told the Judge that there was a potential conflict with the Miami office accepting the appointment. Caruso said that his office has reviewed everything and that he could say "without equivocation" that there was no conflict. Garber took the matter up at sidebar and after conferring, he kept the Miami Defenders as lead counsel. While at sidebar, another Public Defender Tony Natale went up to Padilla and explained what was going on. Another defender, Orlando do Campo, was also present for the defense. Michael Caruso explained that they would need a continuance to prepare for the hearing, and Judge Garber rescheduled it for January 12th at 10AM. Garber also -- at Caruso's request -- moved the arraignment to that date. Garber said that because of the amount of time he has invested in the case that he would retain it for next week's hearing instead of transferring it to the duty magistrate judge. Judge Garber concluded the hearing by commending the parties for acting in the spirit of cooperation. FDC will reopen tomorrow with regular legal and social visits. The 11th Circuit today permitted the filing of amicus briefs in the Cuban Spy case. If you are wondering why this is blog worthy, see here. Althought Jose Padilla grabbed all the headlines today, his co-defendant, Kifah Wael Jayyousi, a Jordanian who became a U.S. citizen in 1987, will likely be free pending trial. He won today in front of U.S. District Judge Marcia Cooke who set a $1.3 million bond, ordered electronic monitoring and that he not leave the South Florida area. Jayyousi has been in special solitary confinement since his arrest in March 2005. This is a huge win both for Jayyousi and his lawyer, William Swor, who won't need to spend countless hours in federal criminal defense lawyer's hell -- preparing a case for a client detained in the special housing unit (called the SHU). BTW, I wonder what Prof. Froomkin thinks now about Judge Cooke. I attended Jose Padilla's first appearance today in the Southern District of Florida. Magistrate Judge Barry Garber presided. The lead Miami prosecutor on the case is Russell Killinger, a well-respected veteran in the Southern District of Florida. In court, Judge Garber told Padilla that his lawyers, Andrew Patel and Donna Newman, called chambers and said they wanted to appear, so the Judge postponed the hearing until tomorrow at 4PM. Just in case, the Miami Federal Public Defender's office was present in court. Padilla appeared calm in court, answering the Judge politely with short yes-or-no responses. Garber explained to Padilla his rights, which was interesting as Padilla has been held for the past three years while lawyers wrangled over what sorts of rights he has. Padilla had a short haircut. He was wearing glasses, black sneakers and an orange jumpsuit. The amount of security was amazing. Helicopters were flying over the courthouse. There were numerous marshals and court security officers in the courtroom. And there was lots of press. I'm sure they were disappointed by the three minute hearing. Nevertheless, there was a certain electricity in the courtroom. The Southern District is a very exciting place to practice law right now, especially with Padilla and Abramoff fighting for above-the-fold coverage. So everyone can see what the comment below was referring to, here are the two hats Abramoff wore for the DC plea and the Miami plea. 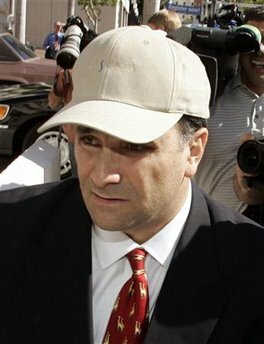 What's the deal with Abramoff's hats? In D.C. he wore an old school fedora and down here he had a baseball cap on. I know his lawyers are giving him excellent legal advice, but who is giving him fashion advice? Biggest case in the country? 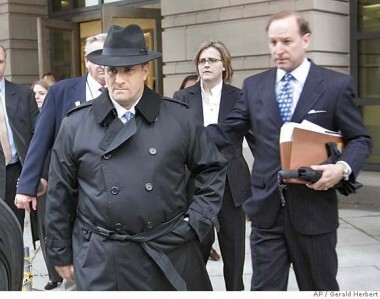 Although the Abramoff case is getting tons of press, I don't think it's getting enough. To me, this is not only the biggest case in the Southern District of Florida right now, it's the biggest case in the country. The breaking news banner on CNN.com this morning is that Abramoff has agreed to a plea deal. Details when I find them out... (update -- here's the CNN article). In the spirit of the funniest Justice article (see post below), I've started a poll for funniest Southern District of Florida Judge (scroll down a bit; it's on the right of the page). I've only included a few of the judges... If you think one should be added (or taken off), please post your thoughts in the comment section. Have fun.